Want to connect with Tab? I'm a mother of 5, with 35 years experience in child care. I have helped to raise many children and I do it because I absolutely love it. My current family is moving after 2 years with them. 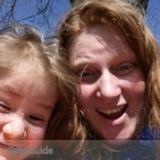 I have been a full time caregiver for the past 3 years, my current family is moving so I need to find new children to love. I have 5 children of my own who are now mostly grown. I do this because I love it and I enjoy interacting with children. RECE looking for Full Time Nannying in Ottawa! Fun and outgoing nanny with 6 years experience as a nanny.